Bánh canh (literally "soup cake") is a thick Vietnamese noodle that can be made from tapioca flour or a mixture of rice and tapioca flour. "Cake" refers to the thick sheet of uncooked dough from which the noodles are cut. Bánh canh chả cá – the dish includes fish cake and is popular in the South Central, Vietnam. 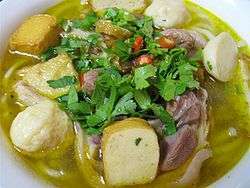 The Vietnamese word bánh refers to items such as noodles or cakes that are made from flour, and canh means "soup." ↑ Alice Pung Her Father's Daughter 2011 Page 194 "Her mother would cook Vietnamese food because that was what she was taught in Saigon: Bánh hói, Bánh canh, fish soup and rice-paper rolls with hot Thai basil and mint." ↑ Sami Scripter, Sheng Yang – Cooking from the Heart: The Hmong Kitchen in America 2009 Page 100 "The Hmong name for them is khaub piaj; the Vietnamese name is bánh canh. These delightfully chewy noodles thicken the soup a little and they soak up a lot of liquid when cooked, so make plenty of broth." ↑ The Little Saigon Cookbook: Vietnamese Cuisine and Culture in Southern California's Little Saigon "Bánh canh giò"
Wikimedia Commons has media related to Bánh canh.